The back page of the NY Times Book Review for May 5 is an article by Judith Shulevitz on blogging. I haven’t read it. All I know is that it makes a passing reference to Small Pieces as a “smart book,” so I am confident that it is the finest analysis of blogging ever published. Chip Morningstar wrote a great piece about literary criticism in the early 1990s called “How to Deconstruct Almost Anything” after his experience at the Second International Conference on Cyberspace in 1991. This is an amusing personal sociology of Post-Modern criticism. The Pseudo Politically Correct term that I would use to describe the mind set of postmodernism is “epistemologically challenged”: a constitutional inability to adopt a reasonable way to tell the good stuff from the bad stuff. This is exactly right, but it — I hesitate to say it — needs to be deconstructed. POMO at its best challenges the comfortable notion of “reasonable.” Buried in that term is an appeal to a privileged standpoint that is usually deeply conservative: facts, rationality or common sense. Believe me, I am deeply sympathetic to Chip’s reaction to POMO. His description of what it’s like to swim among these fish mirrors my own experiences. But an appeal to the “reasonable” ignores what’s most important about POMO analysis. POMO tells us that all understanding is interpretive, that other interpretations are possible, and that our interpretation seems right not because it is right but because it’s our interpretation. It seems like we have two choices: we fall into an indecisive relativism that says that all views are equally valid or we sprain our brains trying to see how there could be a way to tell the good stuff from the bad stuff. To say that there’s a “reasonable way” to do so seems to me to miss the point because it assumes the very thing that we should be stubbing our toes trying to think through. On the other foot (er, hand), I personally think it’s a mistake to assume that we have to choose among fundamental interpretations. We don’t get to fly above all interpretations, including our own, picking and choosing among them. We are our stance in the world, a stance given to us by history, culture, language and accident. So, the lesson I take from POMO is that absolutism is a mistake, that humility is warranted, and that we always have to decide among uncertain choices that are themselves delivered by the accident of history. So, how do we decide whether the post-feminist-meta-Marx-pre-Freudian interpretation of the Book of Job is worth our time? I don’t think POMO actually helps us. It’s better at freeing up creative interpretations that challenge the status quo than at enabling us to choose among those interpretations. My guess is that such decisions actually come after the fact: we’re inspired/energized/heartened by the critique we just read and only afterwards do we try to “justify” why that critique is worthy of belief. Belief is the last in the series. And it’s the least interesting. More important: Does it excite you? Does it reveal the world in a way that matters? Does it set the hairs on your neck on edge? Does it give you a chill? Could any lesson of the Web be clearer? Belief is nice, but it’s not why 500 million of us are here dishing the dirt. Steve Yost, creator of QuickTopic and one of the Web’s Good Guys, has started blogging. So has the always-inventive Stowe Boyd. The fact that he posted a glowing, thoughtful review of Small Pieces doesn’t influence my recommendation, although the fact that he’s an old pal certainly does…as is only proper. Still catching up on the blogworld. I just read Dan Gillmor’s entries about his trip to China. (We almost met up in Beijing.) The bit about demo-ing live weblogging at a journalism conference is another “Aha!” moment from Dan. That’s the question Jacob Shwirtz light-heartedly poses with his brief and witty self-test. 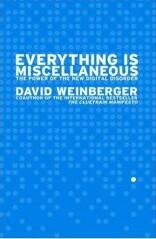 It turns out, that I am a David Weinberger-ish blogger. Return to Normalcy We’re back. We arrived Friday night, literally one minute before the sabbath deadline. Ann was there with open arms as well as hot soup and a loaf of Cheryl-Ann’s best-in-the-world challah. It’s Monday and in some ways the jetlag has gotten worse. Last night, Nathan woke up at 2AM and read in bed until 3:30 when I woke up. We came downstairs, read some Hornblower, watched a little TV, and at 5:20 went to the Pig and Whistle diner in Brighton, a tradition from other jetlagged mornings. He went off to school and I went back to sleep until a 9:30 appointment. How odd time is, transforming presence into memory and experience into stories. We will remember this trip very fondly, I’m sure. Forgetting for the moment the Lessons We Learned, it was just plain fun. For all of the sleep-deprived difficulties, it was a series of good days. And, frankly, much of the joy of the trip for me came simply from getting to be with Nathan non-stop for 12 days. I’ve worked at home for almost all of Nathan’s life, so it’s not like I never get to see him and need to get “reacquainted.” He’s just fun to be with: sunny, funny, deeply sympathetic, and wicked smart. Good combo. We’re lucky parents. As far as getting to see China (well, the bits we saw) through the eyes of an 11-year-old, what I saw mainly was that the similarities run neck-and-neck with the differences. Granting that we were only in cities, so much of life seems the same if only because its landscape is identical: roads, cars, buildings, bridges, sidewalks. It is only within this world of similarity that the differences appear. Not to scant the differences. But they often cannot be read from the experience itself: you might not notice that parents are rarely seen with more than one child and you would never be able to see directly that their children work harder at school than ours do. The world can seem less foreign than it is. But that’s my job as an adult, helping Nathan to see what isn’t on the surface of experience. It’s also what makes adults so damn annoying. We’re back amongst the familiar now. Not everything has to be interesting any more. Although, learning how to be interested in everything — how everything is interesting — is our real work, isn’t it? Comments Off on Return to Normalcy We’re back. Kevin Marks points us to a lecture by Onora O’Neil on whether the openness and transparency of the Web is increasing or decreasing trust. 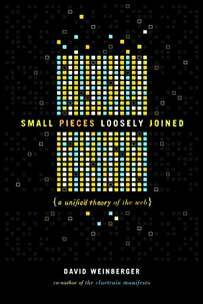 Hugh McKellar, editor of KMWorld, has reviewed Small Pieces, saying, “It’s the best thing ever written about the Web.” He also uses the adjective “side-splitting” in a positive sense. We’re in Guangzhou (nee Canton) for the day. It was hard on us leaving Beijing. I can’t really describe why the city touches me so much. It’s drab, dreary, poor, regimented, and characterized by bureaucratic, over-size architecture. Yet it’s so full of life and a sense of its own future, its own becoming. New York City, Lor’ bless it, is a great city but it already is what it is. Beijing isn’t. Beijing is becoming. And it’s doing so from a past that reaches back immeasurably and to times so radically different than its present that it took a revolution to get here. We come back to the US on Friday. I did it. I ate in a Mr. Donut in Shanghai. And I may well go to Starbuck’s here in Beijing. This has me so upset that I’ve already blogged about it over at the Boston Globe travelblogue (Steve Yost’s term, I think) but I haven’t expiated the sin yet. (AKMA undoubtedly will explain to me all the ways that sins aren’t/can’t be expiated. And sorry to be missing out on the POMO blogthread – it’s just too hard to focus on it while so far away. No that makes no sense and yet it is The Truth.) I will undoubtedly blog about it again.